How to Enter: Snap, Tag, and Win! This contest is simple to enter. Between Memorial Day and Labor Day, take a picture on vacation with our downloadable Brush on Vacation sign (link below), post it on social media, tag us, and let us know where you are! Tag us and share it on Facebook, Twitter, or Instagram! But remember that if your profile or the post is set to private, we won’t be able to see the entry! In that case, just send us a direct/private message with the post to show the likes and location to ensure you still have a shot at winning. Feel free to ask us more about how if you need a little help! We will select and announce the winner once all the entries have been recorded after Labor Day. What could you win? We are offering an iPod Touch or Beats Headphones to one lucky family! You will have your choice of the one that you all will like the most. It is our way of saying thanks for taking part — and for bringing us along on your family vacation! 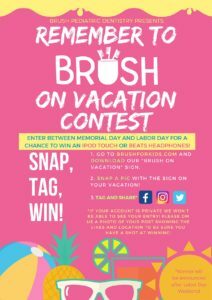 Take Part in Brush on Vacation! The idea behind Brush on Vacation was to encourage families to remember that, even though the routine gets a bit mixed up during the summer, routine brushing and flossing are as important as ever. We hope taking this sign along will be a good reminder to keep brushing and flossing for you and your little ones! Plus, we don’t mind getting to see where our patients are galavanting off to this time of year, either. Now get out there, have fun, and remember to Brush on Vacation!